The people we bought our house from must have used the Big Book of Invasive Plants to plan thier landscaping. We have a number of things in our yard that would take over vast reaches of the neighborhood given a little time and a lack of attention on our part. But one of the worst, I think, are the Morning Glories. Those pretty big purple/blue flowers just lure you in, and then, one day, you realize that all that green in your front planter isn’t the plants you normally see there, but a huge big mound of smothering Morning Glories! Hubby and I are being vicious this year, and are doing our best trying to keep the little creepers at bay. We have waded in to the front planter and ripped out Morning Glories left and right. In a few spots we even managed to pull up some roots, which is so gratifying! I am sure the hydrangeas and camelias are very grateful for our work! I have heard that back east, where they get a hard freeze every year, Morning Glories aren’t such a problem. They don’t come back unless you replant them. But here in So Cal they are a perennial plant, perennially trying to take over my yard every spring and summer! My adice to any of you that live in a temperate climate: DO NOT PLANT MORNING GLORIES! What is in your yard that you are very sorry you (or someone else) planted? An organization I belong to had one of those Goodwill fundraisers last weekend. 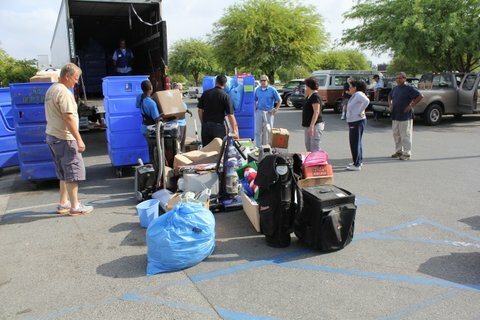 Basically you gather together people’s rummage and donate it to Goodwill and Goodwill returns the favor by paying you for the rummage you collect. Up until last year your group would fill a truck. This year the Goodwlll organization in my area decided to switch to bins. We had to guarantee that we would fill 15 bins. We filled 35. My very small group hefted and toted for 2 1/2 months gathering rummage for this event. On Saturday, when a group of about a dozen volunteers were taking all of the stuff out of the empty storefront where we stored it to the waiting bins, all I could think was that all of that rummage said something about America and it wasn’t saying something good…. The photo below shows just a small fraction of the stuff we had. Yes, by the way, that is a set of golf clubs! Every time I see the photos of the event, it makes me want to try to clean out my house like a mad woman. I try to lay down until the feeling passes! My new job (three months now!) includes a lot of phone time. I take many phone calls as well as take many messages off the phone which I have to return. This self-study in how people leave messages has led me to conclude that many people just do not know how to leave a message. Here are some of my “favorite” types of phone messages and some helpful hints as well. Feel free to forward this on to any recent college graduates. 1. Carefully leave message, with all information enunciated, including the spelling of first and last name, until it is time to leave the most important part, the phone number. Then speed up and talk at least twice as fast and then hang up quickly! But…wait! I need the number! So I have to listen to the last part of the message at least three times to try to understand that elusive phone number. That is so not cool! 2. Repeat all information twice. Why would someone say what their message is, and then repeat the whole message verbatim a second time? I got the message the first time. I don’t need to hear it twice from the same phone call! 3. Just leave the name and phone number and don’t tell me what info you need. So when I call you back all I can do is leave my name and phone number, instead of being able to give you the information you wanted. And so the game of phone tag begins…. Thank you for allowing me to vent. Do you have any phone stories from your workplace? Feel free to vent here! I love the Rolling Stones. I admit that I do not necessarily drive down the road with them blasting away on the car stereo, but I love to see them live. Nobody does a concert like Mick, Keith, Charlie and Ron. I first saw the Stones when they played the Los Angeles Coliseum on October 11th, 1981. It was an infamous concert because Prince was one of their opening acts. I will get to that in a bit. That particular concert was stadium seating, which means you get a ticket but not a seat. My boyfriend at the time (not Hubby) would have been happy to get out on the field and stand for hours and hours. I made it clear that wasn’t going to happen and we sat in the stands, about 2/3 of the way back. Even though it wasn’t a particularly hot day they kept spraying the crowd on the field because the people were so packed together they had to be cooled off so no one would faint from the heat. Fun times! At that concert the Stones had three opening acts: J. Geils Band, Prince, and George Throughgood. I have absolutely no idea why those three were picked. but at the time Prince was still fairly unknown, at least to those of us in the Coliseum that day. That was back in the days before giant screens were ubiquitous at concerts so we, of course, had a pair of binoculars with us, standard equipment for large concerts back then. I still remember when that tiny little man who was Prince came out on stage and started singing. I looked at my boyfriend and asked “Who is that?” But he didn’t know either. After a song or two I finally grabbed the binoculars and looked at the singer. I couldn’t believe what I saw! I told my boyfriend, “He is wearing thigh high black boots, a long black leather coat, and a black leather g-string!” At that point I was done. In these days of Lady Gaga, that outfit may seem tame but in 1981 I (and many others in the audience) were not impressed with the little guy in the g-string! Some people started booing and then the whole audience began booing. Prince eventually ran off the stage and the promoter came on to chastise us, saying something about “What if that was your friend?” I remember telling the boyfriend, “The guy in the g-string would not be my friend!” And that is the story of the time I helped boo Prince off the stage! Anyway, many hours later after the sun set the Stones finally took the stage. Remember, no screens or jumbotron, just bright lights and our trusty binoculars. And that was when I discovered the magic of Mick in concert. Even back where we were sitting in the Coliseum, you could still see Mick strut and wave his arms and it was so so so Mick! No one knows better than he does how to play to a really big room, or stadium! If you have been to a concert anytime in the last 10 or 15 years you will laugh at this. But the big moment of the concert was when Mick sang Jumping Jack Flash and went up in a cherry picker. Yep, whoo hoo, a cherry picker! I remember talking about the concert with people the next week, still breathless over Mick in that cherry picker! That was high rock and roll drama back then! It was at that concert that I fell in love with the Stones. I have seen them a few more times since then but I will tell you about those experiences later. We picked up youngest from college on Saturday and I had my Mother’s Day celebration a day early. A wonderful time was had by all, but especially me! I love having my two chicks with me! When we got home there was a message from Big Bro on the machine. He was feeling pretty good and wanted to get together with us, take a dip in the pool, and have a barbeque. I have been trying to do anything with him that he wants, given the precarious state of his health, so when Bro called, we leapt into action. And that is how Mother’s Day at my house morphed into Brother’s Day. Thank goodness Big Bro isn’t real concerned about the state of our house so a little sweeping, a bathroom cleaning, and some dishwashing did the trick. I ran to the store for some tri tip and fixings and a call went out to Hubby’s Mom to join us for a Mother’s Day meal. So I found myself cleaning and cooking on Mother’s Day and I couldn’t have been happier! I was so pleased that Big Bro felt so good and wanted to be with us. I was so happy that I could meet his very simple desires – meat on a grill, water in a pool, family in the room. Sorry, no photos to illustrate our enjoyable day. You really don’t want to see us in a pool! Hope you had a great weekend as well! Hubby and I celebrated our 27th wedding anniversary last weekend. We waited until the last-minute to decide what to do. Here in Inland So Cal it was going to be a warm day so we decided to head towards the coast. We have some favorite spots out there, ones we have visited many times. But I wanted to go someplace we hadn’t been before. Sometime in the past year the Sunday L.A.Times travel section had an article on California piers. Hubby and I saw that article and decided then and there that we wanted to visit every single one of them. I pulled out the article and it mentioned a pier in Los Angeles County we haven’t visited before, in the town of Manhattan Beach. So the decision was made that Manhattan Beach would be our destination on Saturday. I read some reviews online (what did I do before Google?) and found that the parking can be an issue, as it always is at So Cal beaches. That review I read suggested looking in the lots instead of one the street. That is what we did when we arrived just before 11:30 a.m. and we found a spot right away. I think it helped that we arrived before lunch. 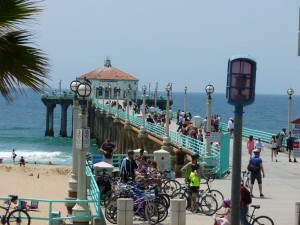 Manhattan Beach is perfect for those who prefer a place that is not so touristy. I kid you not, I didn’t see one single shop that sold tourist geegaws, knick knacks, and/or postcards. While I do love silly tourist stuff, I have to admit, it was a nice change of pace to not be drawn into all of that! However, even if the t-shirt and postcard stores are missing, Manhattan Beach does welcome visitors with plenty of places to eat. There are lots of things I can’t eat and I have to stay away from spicy food or foods with tomato sauce. So when I saw, just up the street and around the corner from where we parked, a coffee shop style restaurant called The Kettle, I knew that is where I wanted to have lunch. It is located on the corner of Highland Avenue and Manhattan Beach Boulevard. The Kettle has both an outside and inside dining area. The Kettle serves breakfast, lunch, and dinner, and at lunch we could get any of those items. Hubby and I both settled on omelets and when we ordered we were given our choice of toast or muffins of various flavors such as honey bran, blueberry, carrot raisin, orange zest, or banana nut. Hey, we were celebrating, so Hubby and I opted for the muffin. 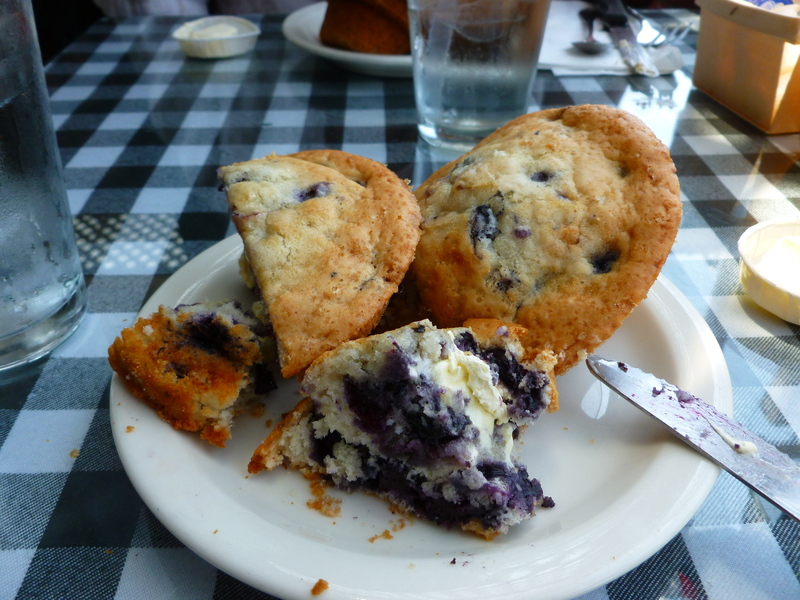 Imagine our surprise when the muffins were brought to our table and we each got two! Yum! Here is a photo of my blueberry muffin extravaganza, after I started to cut one open and slather it with butter. After lunch we went walking on the pier. We stopped and watched the surfers. We stopped and watched the volleyball players. We enjoyed the cool breeze and the view of the ocean. It was just a lovely day. At the end of the pier is a round building which held a small snack bar and the Roundhouse Aquarium. The aquarium is very small, but we still stopped by to see what it included. Entrance is free, but they do ask of a donation of $2 a person or $5 a family. The displays inside include species found along the southern California coast including starfish, jelly fish, and moray eels. In various reviews I read it mentioned it was great for kids. Well, maybe I am a kid at heart or just a nerd, but I enjoyed it as well and so did Hubby. We didn’t stay more than 20 minutes, but it was worth a stop. Manhattan Beach has a lovely walking path that is paved and goes along between the beach and the first row of houses. We didn’t take advantage of it on our visit Saturday but it looked like a really nice place for a stroll. We will definitely do that next time! After we left I kept asking Hubby, “How is it we have never been here before?” Now that we have discovered Manhattan Beach, we will certainly be back! Someone commented on one of my blog posts and used the term “Cali” as in “I know someone who lives in Cali.” For some reason this has amused the heck out of me. “Cali” sounds so cool and hip and everything that California is supposed to be, but probably isn’t. I decided that I should break a few dream bubbles and mention some myths about California that may just not be true. 2. We are all a bunch of bleeding heart liberals. Oh, this one is so funny! In inland Southern California we live in a bastion of conservatism some claim is the legacy of all those Midwesterners who moved here during the Dust Bowl. The liberal folks tend to cluster near the beach and up around San Francisco. 3. We are all tan. Not with the skin cancer in my family. I am aiming for white verging on clear. You better wear sunglasses if I am in shorts! 4. We are all in foreclosure. No, not really. If you didn’t use your house like an ATM or get sucked into some crazy mortgage those banks were foisting off on us, then no foreclose on the horizon. 5. 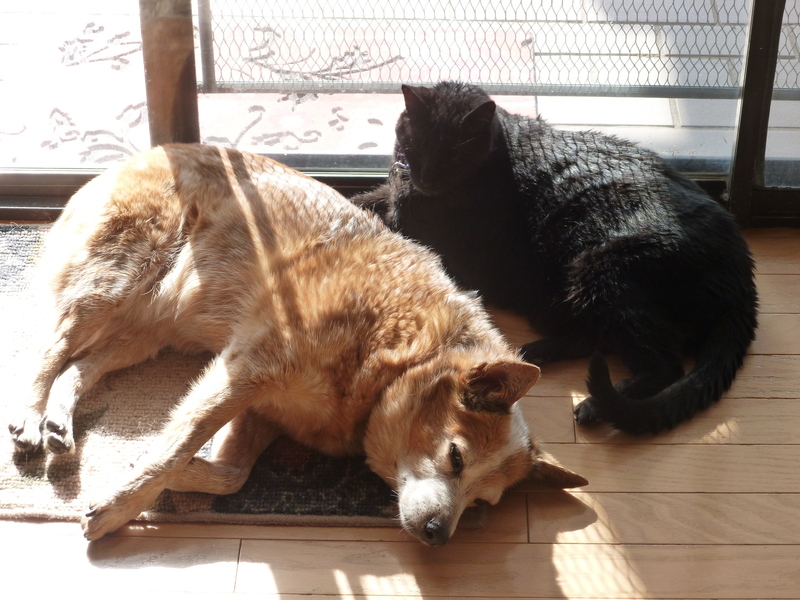 Earthquakes don’t bother us. Well, this one is kind of true. They are better than snow and tornadoes. And if it isn’t above a 5.0 is really isn’t worth talking about. 6. We elect crazy men for governor. Some things we can’t escape. Any state that elects the Terminator as Governor is going to get a reputation. And that reputation is well deserved. 7. There are movie and television stars every where. That would be fun, wouldn’t it? Too bad it isn’t true. Maybe if I lived in Malibu, but out my way you never see them. They are beach dwelling creatures and I don’t live at the beach. Do you have any preconceived notions about California? I would love to hear them so I can tell you if they are true or not! Is is possible for a human being to die of dog hair suffocation? Is it possible for one 29 pound short-haired dog to drop enough hair to cause such suffocation? I am going to say yes to both. This spring we have been dealing with a bumper crop of Honey hair. I am sure there is a little hair from Blackie the cat mixed in but it is mostly Honey hair. Spring is always a hairy time around here but, really, this year is above and beyond the norm. I finally broke down and made an appointment for the dog to get groomed. I had to wait a week later and on that day I stopped sweeping, figuring there was no point until the grooming had occurred. 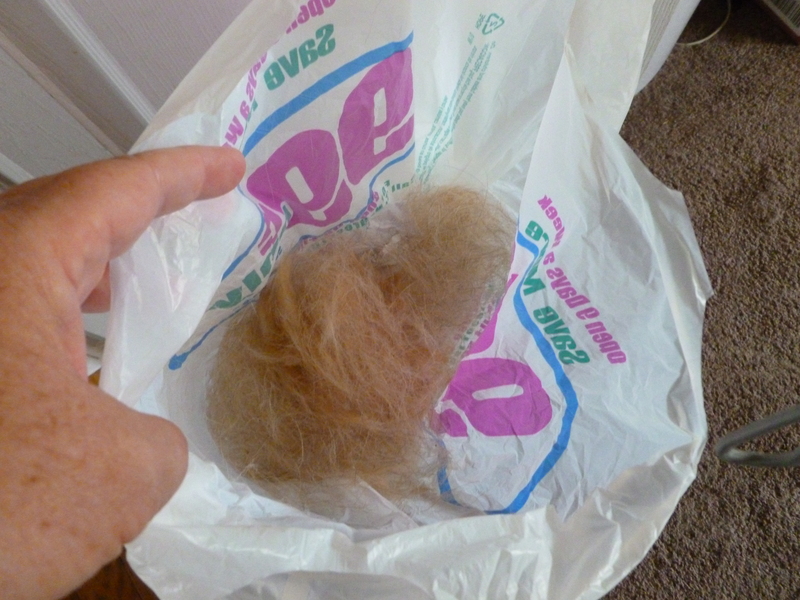 Eldest daughter and I picked up hair and pulled it off the dog in great gobs and ended up with a bag full. The photo makes it look like so much less that it was. 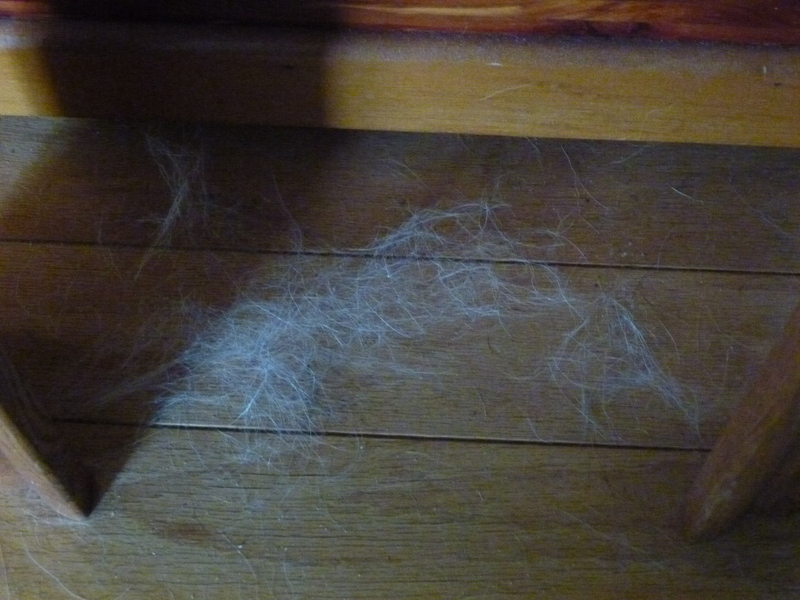 It got so bad that I actually got the following text from Eldest Daughter while I was at work: OMG there is hair everywhere! 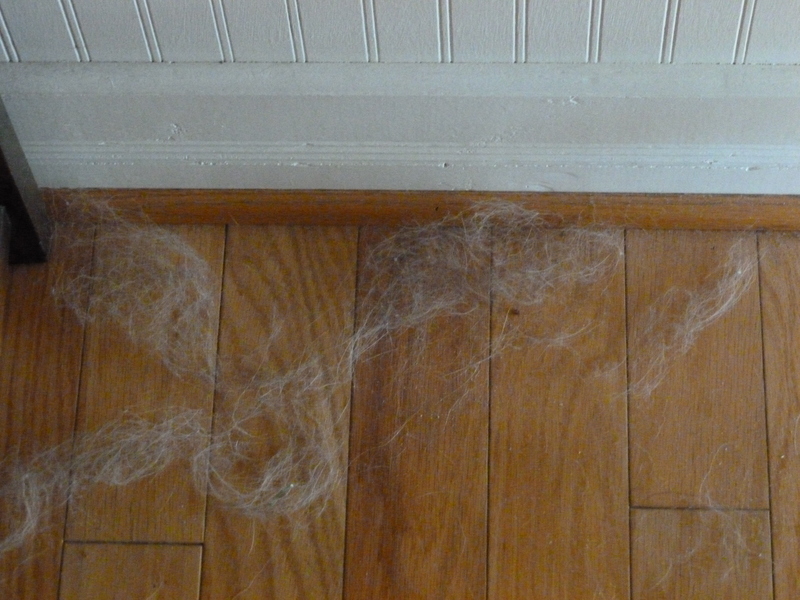 The $45 grooming has now been done and an initial thorough sweeping has occurred. Next Hubby will go through the house with his shop vac (which can also be a blower) and will blow the hair out from under all the hard to move furniture. 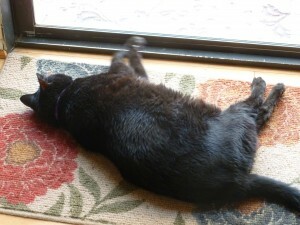 Then I will sweep and vacuum again and we will be good for a few days at least. 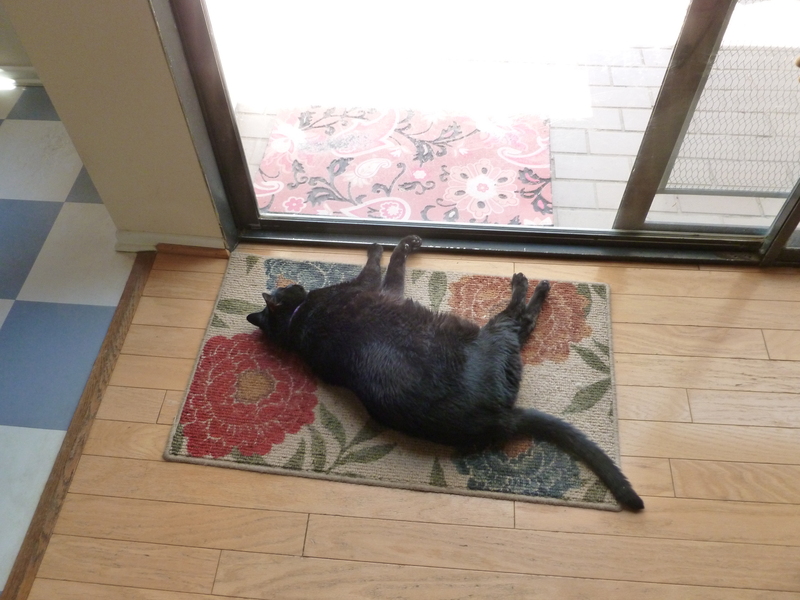 I love my pets but these are the moments when I question my sanity, I have to admit!